Hollywood's propensity to remake classic horror movies has settled into something of an annual tradition at this point, and in 2013, that honor went to the Stephen King/Brian De Palma film Carrie. Disappointing on basically every level, its earnest but awkward attempt to translate its story to a modern setting seemed almost doomed from the start. A few months later, a much less publicized film also featuring a young girl discovering great destructive power in the wake of trauma was released called Dark Touch, and while its just different enough to escape accusations of being a rip off or a mockbuster, its close enough and good enough that in retrospect, one could easily make the case that this was the Carrie reboot that should have been. 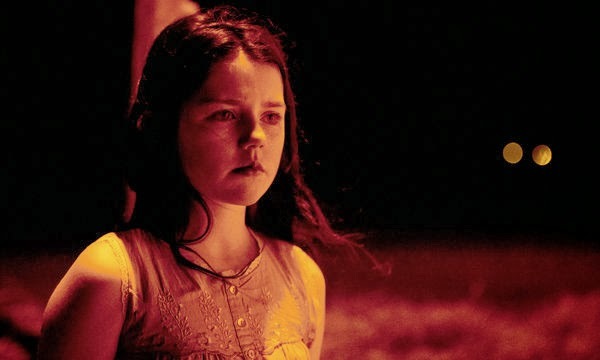 Dark Touch follows a young girl named Niamh sent to live with her neighbors after her parents are killed in a mysterious, supernatural event. Whether or not Niamh is the cause of her parents' demise, and what secret trauma may be behind her powers if she even has them are all technically spoilers, though both should be obvious from the very beginning. This ambiguous approach to the film's reveals is a bit heavy handed, suggesting deeper or more intriguing ideas than its willing to delve into, but what we get proves more than enough, even if it sometimes feels like we're being strung along to get to the place we all saw coming. To dispense with the pretense as the film should have, yes, she has telekinetic powers, as well as a host of other somewhat ill-defined psychic abilities, and yes, they come about due to the intense psychic pain she has in the wake of being molested. Bad Touch might have been a bit on the nose, and to the film's credit it treads as lightly as possible even as it deals with some very sensitive subject matter (maybe even too lightly in some places). Its disturbing but not to the point of ever feeling exploitative, and its all lent a degree of seriousness from a tone that never forgets just where all the events stem from even as objects start flying and everything goes out of control. 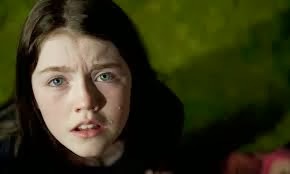 Most of the credit must go to Missy Keating who turns in a tour de force performance as Niamh, displaying the kind of vulnerability this kind of character needs to have in stark contrast to Chloe Grace Moretz' much too self confident Carrie. Keating is just young enough that you might question whether or not its right to put the actress through all of this even within the safety of a movie set, but the ease with which she handles her complex character, reminiscent of the two siblings from Mama, is ironically comforting. I say ironically because the character itself goes to some pretty dark places (no pun intended). The writer/director Marina De Van is apparently known for some pretty extreme material, and while Dark Touch is not particularly gory, the initial premise of psychic force powered by molestation is only the start of the roller coaster of despair. The movie is brutally unsentimental and doesn't waste time trying to come up with pat resolutions to the issues it presents, never demanding that we pity Niamh or justify her actions when she realizes the full extent of her abilities. Without too many spoilers, don't expect a happy ending, and if the idea of juvenile mass murder offends you in any way, don't say I didn't warn you. The ending in particular is interesting because it mirrors Carrie in that sense that innocents are punished along with the guilty, but in this case, the motivations of the character exerting that judgement are so much more real that it feels like more than just an excuse for bloodshed. The film does have its flaws, mostly in its failure to fully explain just what Niamh can do and why she's doing it. The initial breaking point is clear enough, but things get a bit muddled in terms of the escalation that eventually brings her to the point of telekinetic madness. To continue the Carrie analogy, there isn't really anything to point to that would qualify as a Pig's Blood moment, which in its way is arguably better as you're left to assume its simply the culmination of events that drives her, rather than one crystallizing event, but as a viewer, its easy to feel bewildered by her mostly internal evolution. Also, the film tries to throw in other powers that seem unnecessary in retrospect, as she could have accomplished the same things without them, and by the end its all a little more confusing than it has to be. 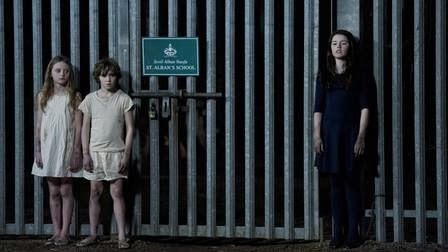 A strange psychic connection with one of the adults suggests a plot thread that never really materializes, and her Pied Piper control of children, despite leading to one of the most chilling sequences, seems superfluous in the end. 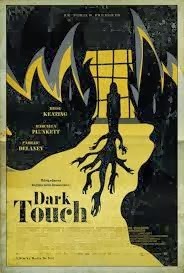 Still, overall, Dark Touch is a great spin on an old story, taking the creepy super powered kid sub-genre of horror movies and producing about the most thematically explicit and powerful version of it in recent memory. Going back to Carrie one last time, Stephen King has gone to this same well maybe a few too many times over the years, to the point where a kid with psychic powers showing up in one of his books or movies has now become a cliche if not an outright drinking game for marathoners, and yet rarely is this trope ever used to say anything about what it means to be a kid in a world where childhood and the innocence attached to it is constantly under threat. Dark Touch does this respectfully and viscerally, placing you in the shoes of a girl betrayed by the world around her with no frame of reference for how to react to something that should never happen to anyone, and as it descends into increasingly uncomfortable chaos, it never loses sight of the reality of the child in the middle of it.